Michael Bazzett’s poems have appeared in Ploughshares, Massachusetts Review, Pleiades, Oxford Poetry, Virginia Quarterly Review and Poetry Northwest. 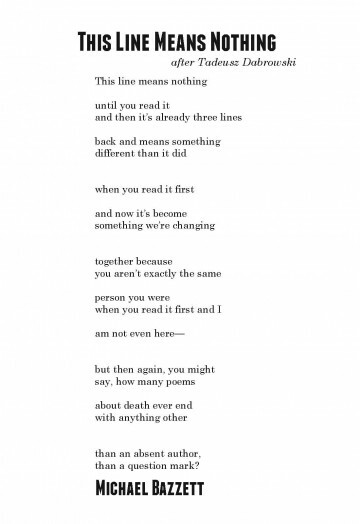 He was the winner of the Lindquist & Vennum Prize for his first full-length collection, You Must Remember This, (Milkweed Editions, 2014). Writers need readers just as much as readers need writers. That runs counter to the common misperception of poets as lonely geniuses who don’t care if they’re read or not. Bazzett calls out this lie right off: “This line means nothing/ until you read it” and then adds a layer of complexity to the equation: time. By the time the reader completes the poem’s meaning, the poet has already grown a little, become a slightly different person than he was when he wrote the poem. The reader grows, too, and for a while the gaps are manageable. Conversation—the co-creation of meaning—is possible. That any conversation is possible at all makes the question at the end of this poem all the more poignant. Eventually the gap between writer and reader is too big, and there is silence—the product of death and also a kind of death in and of itself. There’s an insistence in the tone of this poem—it’s not a handbill per se, but it reads like one. Franchise has the weight and height to make the handbill’s demand: Read Me! For the body, Century Schoolbook has shorter ascenders and descenders, which give it a subtle, block-like look to echo Franchise’s small caps. That same blocky-ness makes the irregular spacing—a device the poet uses as additional punctuation—more apparent. The cumulative, newsy effect matches the urgency of the poem’s direct address to the reader.